There are lot of myths about consuming carrot greens which upsets me. They are called bunny food and most people tend to throw them away since they are not eaten in their culture. What upsets me the most about food myths is, that some foods are superfoods packed with nutrients to protect your body from so many incurable diseases. One of these superfoods are Carrot Greens. The health benefits from carrot greens are innumerable, but some bodies don’t adapt to them and face indigestion issues. Don’t worry, that is very rare. The same fact works out for potatoes too. But we still eat them and love them, right? I posted this a couple of days before on my instagram and facebook page, discussing on the trends of eating most our super foods. Look at these beautiful greens and who wouldn’t want to eat them. I agree, Carrot Greens can be little bitter to eat on their own but they aren’t as bitter as we think they are. They taste so good in Salad, Pizza or Sandwich Toppings, Soups or Stews, Indian Curries, etc. My humble request is to use the greens right and eat lot of greens in a day. What are the Benefits of Eating Carrot Greens? Carrot Greens have nutrients like Vitamin A, Vitamin C, Dietary Fibers, Iron, Calcium, etc… And you might say that we get these from all other greens too. But, lets just add one more type from the many greens we eat in our bucket. Carrot Greens have numerous health benefits and I am going to list them down here. Also, I am going to add some links for you guys to visit some websites to source the information from in detail. I am quoting the following from https://drhealthbenefits.com/food-bevarages/vegetables/health-benefits-of-carrot-leaves. 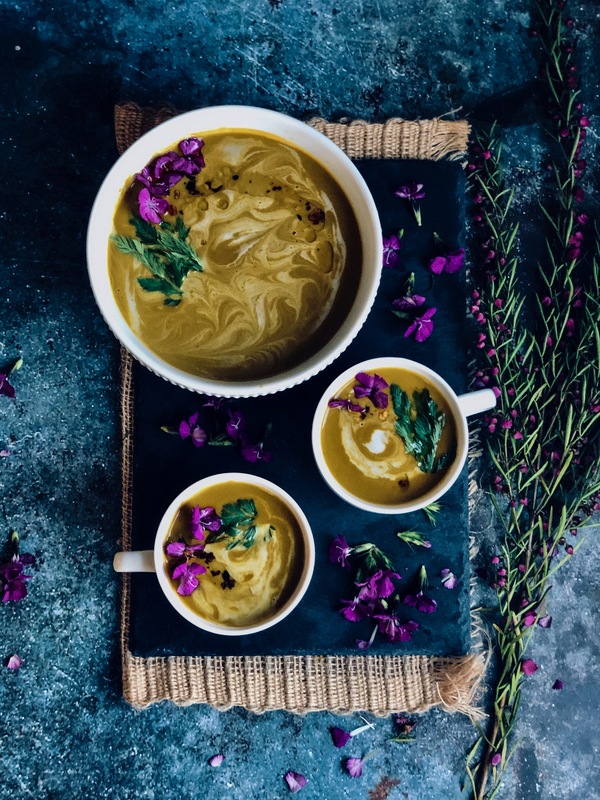 This Vegan Soup is a delectably sweet and spicy combination with all the goodness of beautiful veggies. It is very simple to prepare and takes about 40 mins and a delicious dinner is ready. Serve hot with some garlic bread or rice on the side and I am sure you are going to love your dinner. In a heavy bottom, pot on a medium-low flame, add 4 Tbsp oil. Once heated add Red chili flakes. Sauté and keep about 2 Tbsp of chili oil separately to use the chili oil for topping on the soup before serving. Add sliced onions and let them caramelize. Once they caramelize add grated garlic and sauté. Once the garlic browns up a little add the veggies. Add Red Cayenne Pepper, Oregano and Salt. Mix the veggies well with the spices and add water/ vegetable stock. Stir well and Let it simmer for 10-15 mins. Once the vegetables are boiled and the water is reduced by 1/3rd. Turn off the stove and let it cool. Once cool add to your mixer jar and grind it. Once the soup is pureed nice and soft strain it using a strainer to have a nice smooth texture. Add coconut cream, give it a nice mix, simmer it for 5 minutes and you the soup is ready. Top your soup with some coconut cream and chili oil. Serve hot with Garlic bread or rice. We enjoyed it with garlic bread and wild rice. This entry was posted in International Recipes. Bookmark the permalink.